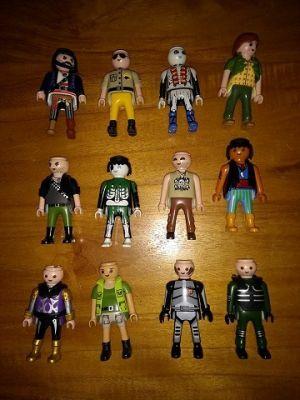 I'm sorting my sons playmobil but these klicky's are lost, can you people help me from what sets they are? Quite a mixed group there. Top right is the werewolf from the playmo-friends (nothing to do with here ) range 6824. Top left is probably from 5408, a special plus set which also included a black wolf with red eyes. 2nd fig top usually has a dark helmet with gold visor and purple feather with gold round shield - appears in a couple of different sets. Ist fig 3rd line is a motorcycle rider from 3062 - comes with red touring type harley bike. 4th fig 5th line is a pirate that came with a small rubbery monkey. Easter egg set 4915 with green egg but this fig may exist elsewhere. 1st figure 2nd line is a biker from Series 13 (9332). 2nd figure 4th line as well as 1st figure 5th line: both from Duo Pack 9217. 3rd figure 5th line bad guy, also known as Karlchen from Germany’s youtube videos, is from 5421. 4th figure 5th line is a playmo-friends pirate 6822. 2nd figure 6th line is a playmo-friends girl 9074. Anyone know where the two ghost pirates came from? The bare-feet one is probably from 4801...? I'm pretty sure you're right, they're certainly the same ground figures.